Prepared foods, for sale in streets, squares or markets, are ubiquitous around the world and throughout history. 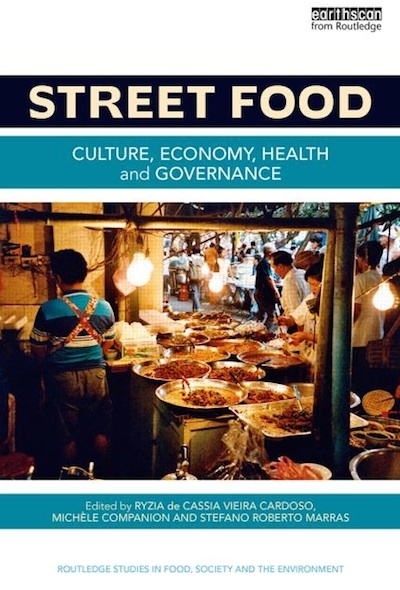 This volume is one of the first to provide a comprehensive social science perspective on street food, illustrating its immense cultural diversity and economic significance, both in developing and developed countries. 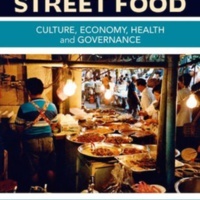 Key issues addressed include: policy, regulation and governance of street food and vendors; production and trade patterns ranging from informal subsistence to modern forms of enterprise; the key role played by female vendors; historical roots and cultural meanings of selling and eating food in the street; food safety and nutrition issues. Many chapters provide case studies from specific cities in different regions of the world. These include North America (Atlanta, Philadelphia, Portland, Toronto, Vancouver), Central and South America (Bogota, Buenos Aires, La Paz, Lima, Mexico City, Montevideo, Santiago, Salvador da Bahia), Asia (Bangkok, Dhaka, Penang), Africa (Accra, Abidjan, Bamako, Freetown, Mozambique) and Europe (Amsterdam). Ryzia De Cássia Vieira Cardoso is an Associate Professor at the School of Nutrition, Federal University of Bahia, Brazil. Michèle Companion is an Associate Professor of Sociology at the University of Colorado, Colorado Springs, USA. Stefano Roberto Marras is a Sociologist and president of Street Food SQUARE, a non-profit organization based in Milan, Italy. Ryzia De Cássia Vieira Cardoso (Dir. ), Michèle Companion (Dir. ), et Stefano Roberto Marras (Dir. ), “Street Food. Culture, Economy, Health and Governance,” Crévilles, consulté le 21 avril 2019, http://crevilles.org/items/show/40187.